Nokia Planning an Exit Strategy Already? 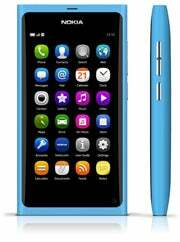 Nokia has unveiled the N9, its latest flagship smartphone, the first device to run the MeeGo operating system. Meego has been heralded as Nokia's strategic move against increased competition from rivals Apple and Google. The N9 looks like one of Nokia's finest works to date: it has a 3.9-inch AMOLED display (854 by 480 pixels resolution), which is made from scratch-resistant curved glass, with no buttons on the face of the phone; the body is made out of polycarbonate, which Nokia claims will help with reception issues. There's also an 8-megapixel camera on board and NFC capabilities. But hardware is not the N9's problem - it's the software. The phone runs on the latest iteration of MeeGo (even though it's not mentioned anywhere on the promotional site), which Nokia developed as a response to Apple's iPhone and the Android army. But the problem is MeeGo is obsolete, even before the N9 goes on sale. Earlier this year Nokia, under new management, realized it was standing on a "burning platform." Symbian and MeeGo, Nokia's smartphone operating systems, were too expensive to maintain and they were years behind competitors' sleekness and usability. Nokia's new CEO realized this and decided to strike a deal with Microsoft and put Windows Phone 7 on its top smartphones. The first Nokia Windows Phone 7 devices are set to arrive later this year, while Symbian and Meego phones will be slowly abandoned over the coming months (or relegated to cheaper feature phones). It makes little sense to buy the N9, with an OS soon to be put to pastures, regardless of Nokia's excellent craftsmanship when it comes to hardware. If you really want a Nokia phone, you are better off waiting until later this year for one of the Windows Phone 7 models.